On August 24, 1987, a final rule covering all employers was published in the Federal Register. Due to subsequent court and administrative actions, for a number of months OSHA was prevented from enforcing the rule in the construction industry, and enforcing in any industry certain requirements dealing with the maintenance of material safety data sheets on multi-employer worksites, coverage of consumer products, and the coverage of drugs in the non-manufacturing sector. As a result of further court actions, all provisions of the rule are now in effect in all segments of industry. OSHA, however, extended the compliance date until March 17, 1989, for programmed inspections in the construction industry and the three previously disapproved provisions. The result of the court actions necessitate revisions to the HCS directive. Attached for your review is a draft copy of our proposed changes. Please review and notify us by April 3, of any comments you may have. All provisions previously disapproved by the Office of Management and Budget are now in effect. consumer products not used in a similar manner in which they could be used by a consumer are covered by the HCS. material safety data sheets are required for drugs used by employees in the nonmanufacturing sector if they meet the definition of a hazardous chemical. 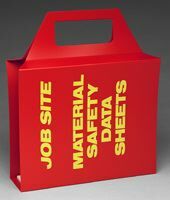 material safety data sheets must be made available to employees on multi-employer worksites. Paragraph (e)(2)(i) requires an employer on a multi-employer worksite to provide another employer with a copy of a MSDS, or to make available the MSDS at a location in the workplace, for each hazardous chemical the other employer's employees may be exposed to. Therefore, one employer does not actually have to physically give an other employer the MSDS, but the employer must inform the other employer of the location where the MSDS will be maintained. The performance-orientation of the rule allows employers to decide the method to be used to accomplish the required exchange of information. In the construction industry, it would probably be most efficient for the general contractor to coordinate the requirement for maintaining MSDS on site. For example, the general contractor could keep and make available MSDS in the office on the site. An employer must provide other employer(s) MSDS if the other employer(s) will have employees exposed to potentially exposed. For example, if a painting contractor's workers are using flammable solvents in an area where another subcontractor's workers are welding pipes, then the painting contractor must ensure that the MSDS are available. However, if electricians are not working near or at the same time as, the paving contractor, and therefore it is not possible for either employer's employees to be exposed, then no exchange of MSDS is required. The written hazard communication program must be maintained at each workplace where the employer has employees exposed to hazardous chemical. The program may be anywhere on the jobsite, including in a vehicle, as long as employees know where to find it. Please provide your State Plans with a copy of this memo and the revised Instruction for their review and comment. If you have any questions, please contact Mr. Steve Simon at FTS 523-8036.